There are thousands of versions of the song “Come Thou Fount of Every Blessing.” All of them contain some variation of the following verse: “Here I raise my Ebenezer. Here by thy great help I’ve come.” So, what in the heck is an Ebenezer? Why are we song-fully raising it? In case you don’t know (and since the song is probably going to be stuck in your head for the remainder of the day), allow me to help you avoid singing in ignorance. 1.) To remind them of important events. 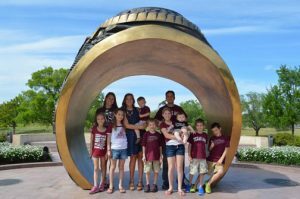 They didn’t want to forget the big things that God had done for them, so they set up giant monuments that served as permanent visual reminders. 2.) To teach their children about important events. It worked kind of like this: 8-year-old Habakuk Jr. would be walking around one day and see a giant man-made pile of rocks. “Dad, what’s that?” Habakuk Sr. then had an opportunity to tell the story of the particular event that the monument was commemorating. Specifically, he would pass along the story of how God worked through that event. It was an excellent way to pass stories down to future generations. A friend of ours, Milton Jones, gave a sermon a few years back about this Ebenezer stone. In the sermon, he mentioned the idea of creating an “Ebenezer wall” in our houses that would serve the same purposes as the monuments of the Old Testament. Great idea, Milton Jones. Recently, we began creating our Ebenezer wall. Our wall consists of black and white picture reminders of monumental things that God has done in our lives. On each picture, we’ve written a short explanation of the event. It has been a wonderful daily reminder-especially during tough times-of the great things that God has done in our world. So, today I’m passing along Milt’s idea. Do yourself a favor. 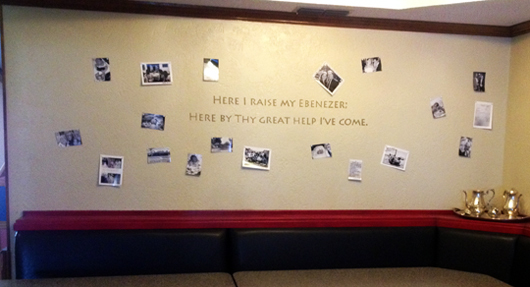 Create an “Ebenezer wall” in your house. It is a fantastic reminder, teaching tool, source of encouragement, and conversation starter. Previous post Surprise, world. We have some news to share.